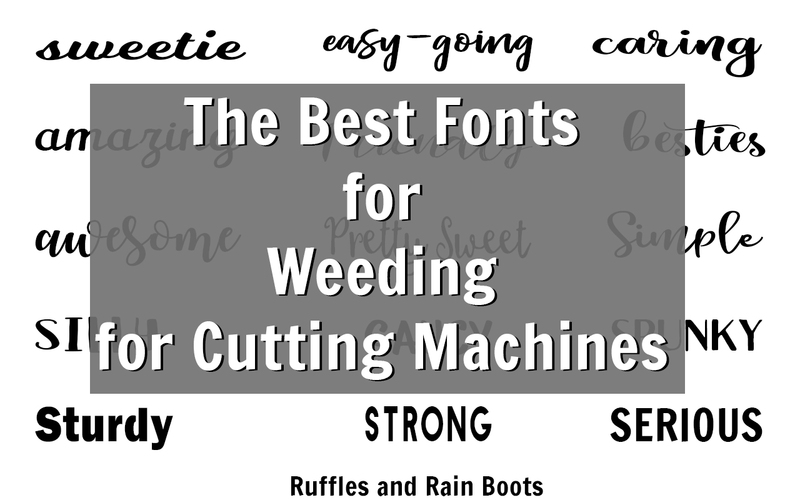 Avoid the frustration and use these best fonts for weeding. No matter what machine you have, these script and bold fonts make it easier. I’m no expert, but one of the biggest frustrations I had when learning to use my Cricut was weeding fonts. When I chose the ‘wrong’ font, the material didn’t matter, nor did the tools – I was in for a stressful time. 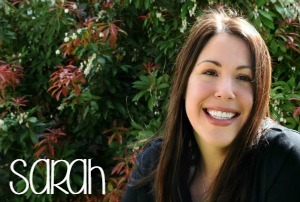 I really want to help you avoid the nail-biting, tool throwing frustration I experienced. 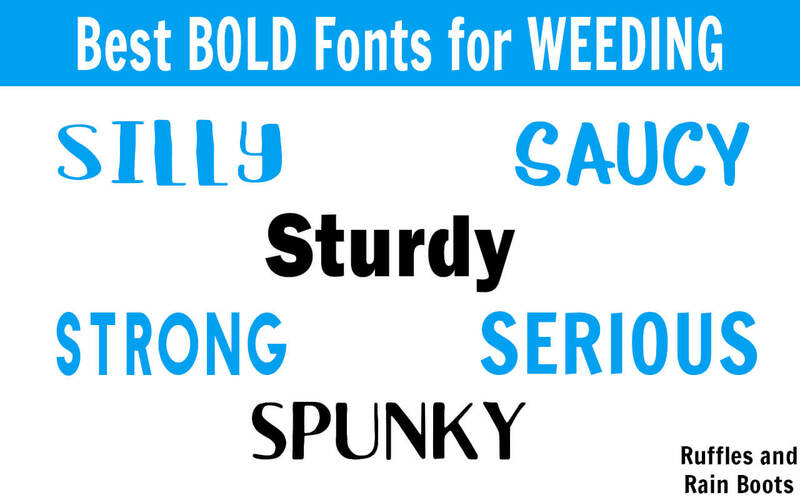 So, I put together a list of what I consider the easiest fonts to weed. I’ve included some script fonts and bold fonts. If you want to be notified when we release a new free font or free SVG collection, sign up for the once-weekly email from Ruffles and Rain Boots. We share crafty goodness each week and nothing more. The script fonts below can also be used for the pens, but these are thicker fonts so keep that in mind. Some are free, some are not. Sweetie: This sweetie is a strong font for most crafts. I love the vintage feel. Amazing: She really is amazing. I love her as an accent font. 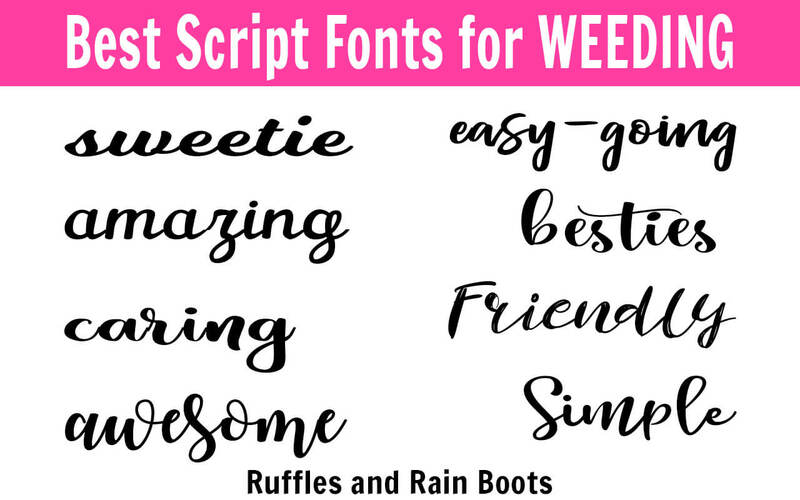 Caring: This is my favorite font duo – I use this for a lot of projects because both of the fonts are some of the best fonts for weeding. Plus you get extras – I love extras. Besties: You’re going to want to braid each other’s hair! She’s a fun font to have. Easy-Going: This hand-written font is a workhorse. Great for bold accents, too. Simple: I grabbed this font a few months ago and it’s one of my favorites. You can reposition it well to have a continuous script or separate it. LOVE it. Pretty Sweet: The way the hand lettering drop letters bounce puts a smile on my face. Awesome: Yes, this font is exactly that: awesome. Can you tell I’m a sucker for a bouncy font? Regal: Well, I messed up here, friends. Regal is “awesome” from above. But here’s another vintage-inspired goodie I use a lot. Check out the fun and tested items we love for crafting with the Cricut machines! The fonts below are some of the best fonts for weeding because they are stocky and thick. They’re great as primary fonts alone or to accent script or handwriting fonts. Silly: Don’t you just love it when you get extra? I’m a fan of this font and the extras (3 fonts)! Serious: Don’t let him fool you, this fun can be fun, serious, or a workhorse. Love it. Strong: Bold and clean, this fella is another one I turn to a lot. Try widening him and see the effect. Spunky: I. LOVE. THIS. SET. of fonts. It’s one of my favorite font families and I use it all the time. Note: I have many businesses, so it makes sense for me. Sign up and watch for deals on The Hungry Jpeg. Saucy: Doesn’t this just remind you of an old newspaper ad? Layer it and it’s magical! Sturdy: This one definitely lives up to the sturdy moniker. It’ll come right on off that sticky mat! Which font on this list is your favorite? What about a font that ISN’T on this list? Let me know in the comments and I’ll make a project with it to test it out and add it to the list.